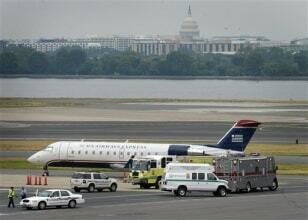 A US Airway plane sits on the tarmac at Reagan National Airport in Washington, surrounded by police and emergency vehicles after a bomb threat was made at an airport ticket counter in Ohio. When the plane landed, authorities swept the plane for explosives and interviewed the 44 passengers aboard. An FBI spokesman says no explosives were found aboard.